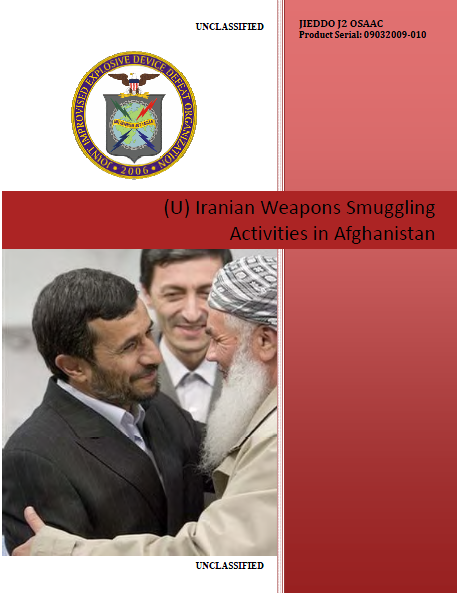 (U) This study investigates Iran’s strategy of smuggling weapons to Afghan insurgents. Based on the hypothesis that Iran utilizes its weapons smuggling networks as proxies to leverage against foreign threats with predictable results, this study will address Iran’s future weapons smuggling behaviors. Iran, like the United States, is a complex actor pursuing rational, national strategic objectives. The perceived dichotomy between Iran’s words and actions results in an atmosphere of suspicion surrounding Iranian motives that can potentially lead to unintended escalations between Iran and other nations. An increase in tensions between the U.S. and Iran, specifically over perceived threats to Iranian sovereignty, will be matched with an increase in the rate and quantity of weapons, an introduction of more capable weapons, or both. Given the elasticity of realizing strategic success by increasing the rate and quantity of weapons, Iran will likely attempt to quickly counter an imminent threat by deploying more destructive weapons comparable to those Iran supplies to Lebanese Hezbollah. Although these escalations may not result in full-scale war, Iran will engage in alternatives to direct conflict by using weapons supply networks to leverage regional insurgents, including Afghan militants, against Iran’s real and perceived threats. It is the purpose of this paper to identify the goals of Iran’s foreign policy, the means by which Iran pursues those goals, and the ability with which we can predict the threat to U.S. Forces posed by Iranian weapons smuggling to Afghan insurgents. • (U) On balance, Iranian foreign policy shares many of the same goals as U.S. foreign policy in the region. The smuggling of Iranian weapons to Afghan insurgent groups is simply another tool to leverage against foreign threats while maintaining overall cooperation in the stabilization of Afghanistan. • (U) Iran historically fosters some form of relationship with all regional actors, including its own enemies, in its pursuit of national interest. This strategy is not simply meant to counter U.S. regional interests, but to actively extend Iranian influence and maintain strategic awareness of important actors at the state, sub-state, and non-state levels. • (U) Iran’s use of weapons smuggling networks is fairly predictable and meant to shape the manner in which foreign countries deal with Iran. If the U.S. and Iran maintain the status quo, Iran will continue to supply weapons to Afghan insurgents at the same quantity, rate and type as it has over the past several years. An increase in tensions between the U.S. and Iran, specifically over perceived threats to Iranian sovereignty, will be matched with an increase in the rate and quantity of weapons, an introduction of more capable weaponry, or both. • (U) Insurgent access to Iranian conventional weapons can have a greater impact against U.S. Forces, reminiscent of how Lebanese Hezbollah’s used Iranian weaponry to frustrate Israeli military efforts during the 2006 war in southern Lebanon. Explosively Formed Penetrators (EFPs) smuggled to Afghan insurgents for use against U.S. Forces represents the current threshold above which Iran will likely not progress without significant escalation. (U) Iran provides arms and funding to Afghan insurgents as it continues to do so in Iraq. Iran’s intentions are the same in both Iraq and Afghanistan: to develop, fund and arm proxy networks to leverage against the perceived U.S. aim of pursuing an active regime change doctrine in Iran. Iran’s use of proxy weapons smuggling networks may be unpleasant, but in practice, Iran restrains the full potential of these networks in Iraq and Afghanistan. Iran can use its shared borders to more quickly and efficiently fund, train, and arm its proxy networks in Iraq and Afghanistan, yet Iran has deliberately withheld many of the high-powered rockets, SAMs and other munitions that Hezbollah fielded against Israel. Iran’s introduction of EFPs in Iraq and Afghanistan has irritated U.S. military and political leaders enough that an Iranian escalation of weapons is not necessary for Iran to apply an uncomfortable amount of pressure on the United States. (U) Conceding the restrained nature of Iranian meddling in Afghanistan does not imply that Iran’s actions should be acceptable to U.S. policymakers. The United States has been careful to avoid leveling direct accusations against Iran for providing insurgents with weapons and training in both Iraq and Afghanistan. Official U.S. comments concerning the discovery of Iranian-made weapons in Afghanistan are careful to suggest that the Iranian government may not be the direct supplier. This backs Iran into a corner, but allows room for the possibility that sub-state actors such as al-Quds and criminal elements may covertly operate outside of regular Iranian government powerbrokers. Washington may be able to subtly shift Iranian threat perceptions if the U.S. can better define that Sunni fundamentalists pose an ideological threat with no resolution, while fears of U.S. intentions can be systematically disproved. A more difficult hurdle will be shaping an alliance against Sunni fundamentalists in Afghanistan that does not appear to undermine the legitimacy of the Iranian government’s carefully crafted image as the world’s only true Islamic Republic. Unlike Iraq, Afghanistan is not a majority Shi’a country, and Iran must tread more lightly in supporting Shi’a interests.